Looking for a New Hyundai Accent in your area? 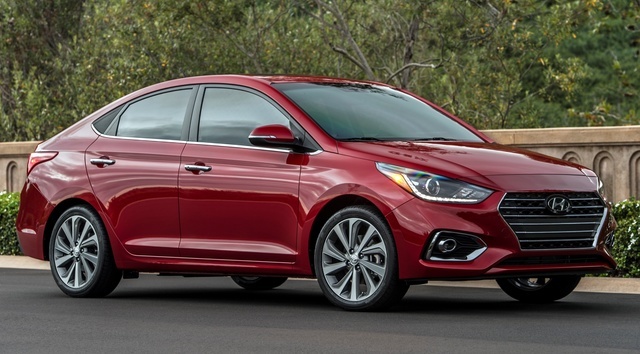 CarGurus has 885 nationwide Hyundai Accent dealers with 6,076 new car listings. The all-new 2018 Hyundai Accent is proof that small, affordable cars can be great. With a starting price below $15,000, the all-new 2018 Hyundai Accent is one of the most affordable cars on the market. But despite its low cost, Hyundai loaded the Accent with stylish design, desirable options, and a 10-year powertrain warranty. Yes, similarly priced used cars can also be a great value, and buyers shouldn’t overlook the class-leading Honda Fit. 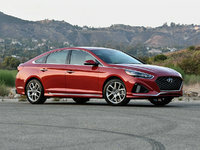 But if you don't want to spend a lot to buy a brand-new car with a traditional three-box sedan design, the Accent is your best bet. 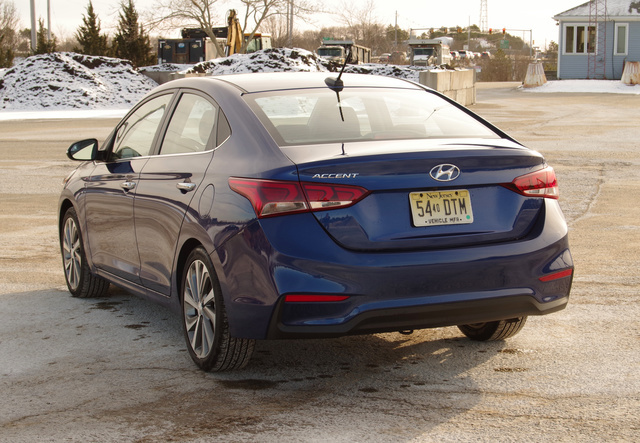 Unlike the gawky Mitsubishi Mirage G4 and Nissan Versa sedans, the Hyundai Accent doesn’t look like a small car. That’s largely thanks to its rear three-quarter view: The C-pillar that holds the roof up slopes in the opposite direction of the Accent’s chrome trim, which creates an optical illusion that makes the car look larger than it is. Its 17-inch alloy wheels don’t hurt, either. 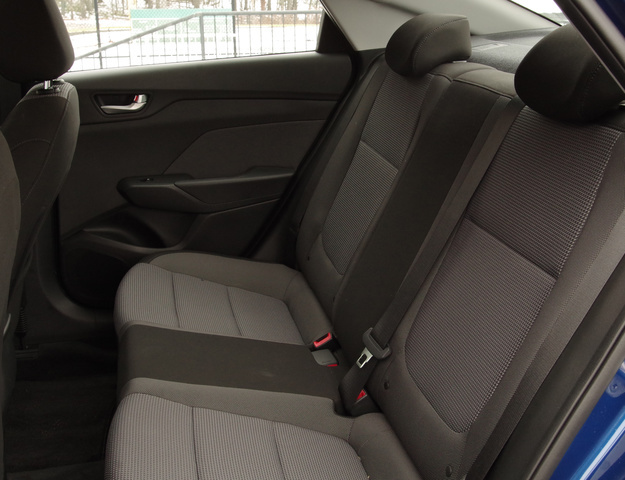 Of course, those wheels and that trim are available only on the $18,895 Accent Limited. The $17,295 SEL drops the chrome trim and 17-inch alloys, and the entry-level SE comes with steel wheels. 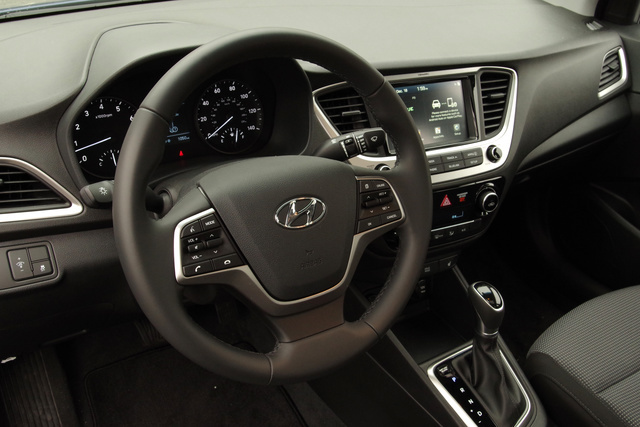 No matter which trim level you choose, however, you’ll get an interior that’s simple and straightforward—and free of distractions. Buttons are big and labeled in plain English, and gauges are all easy to see. In a cloud of complicated dashboards, the Accent is a breath of fresh air. 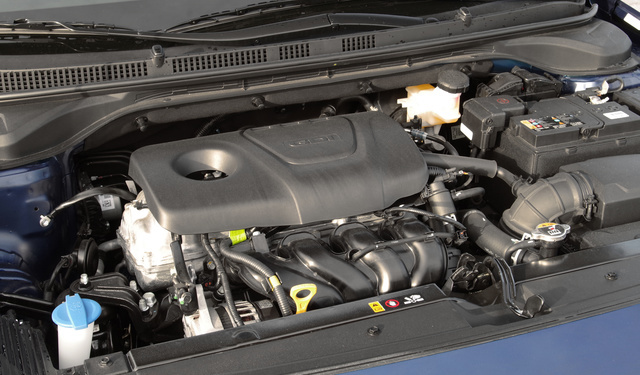 The Accent’s sole engine choice is a 130-hp, 1.6-liter 4-cylinder. Despite it being a carryover from 2017, its horsepower rating actually dropped a bit. Hyundai claims that’s because the engine was retuned for better efficiency and more power at city speeds. Indeed, I found the front-wheel drive (FWD) Accent pleasant in around-town driving. It’s easy to park, and it has a decent amount of power when accelerating from a stop or low speeds. Most drivers will appreciate how well the Accent’s suspension splits the difference between sporty and cushy. However, the optional 6-speed automatic transmission (only the base SE comes standard with a stick) was a little slow to respond to inputs, and the Accent's steering feel was too relaxed for my taste. On the highway, I was impressed by how well Hyundai eliminated noise and vibration. The seats were comfy, and I’d have no problem taking the little Accent on a long road trip. I got about 29 mpg in combined city and highway driving, which is only a little less than the Accent’s EPA rating of 32 mpg. Hyundai dropped the Accent hatchback for 2018. Mitsubishi, Nissan, Chevy, and Ford still sell basic affordable 5-doors, but so does Kia, whose all-new Rio hatch shares a lot of DNA with the Hyundai. But if you prefer the look of a sedan, the Accent is a practical choice. It comes with 90 cubic feet of passenger space, which is more than the Yaris iA and Ford Fiesta offer. It’s even classified as a compact car by the EPA. 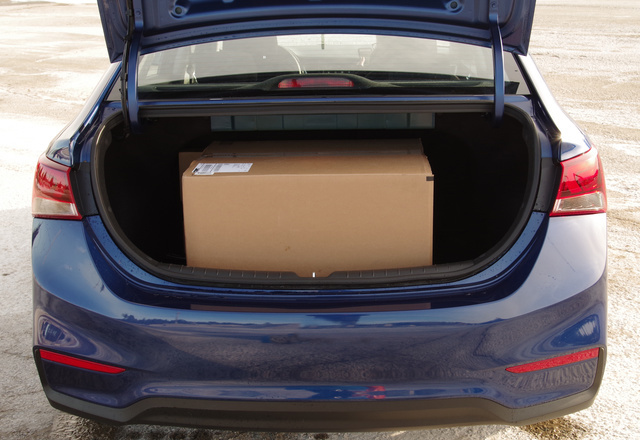 This 5'11" reviewer appreciated the leg- and headroom up front, although rear passengers might complain on longer trips. Bluetooth and a reversing camera are standard on every Accent. 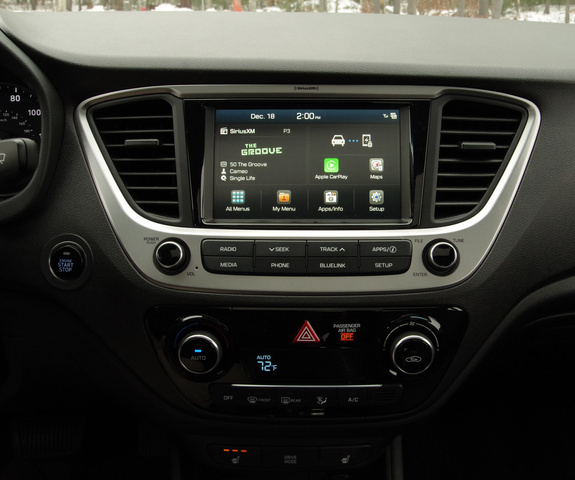 Apple CarPlay and Android Auto, which put your phone’s navigation and music apps on the Accent’s touchscreen, are available only on the SEL and Limited trims. Automatic headlights, a telescoping steering wheel, heated side mirrors, and rear disc brakes are all standard on the SEL. The Limited adds a power sunroof, a proximity key with push-button start, heated seats, and automatic climate control. None of the options are available a la carte—you have to take them all as part of a package that goes with the trim level. Neither the National Highway Traffic Safety Administration (NHTSA) nor the Insurance Institute for Highway Safety (IIHS) has crash-tested the new Accent. The only available active safety feature is automatic emergency braking—and that's available only if you pay for the Limited. By comparison, the Honda Fit offers optional lane-keeping assist and adaptive cruise control. Yes, the Accent is a great small car. But don’t forget: There are tons of used crossovers, sedans, hybrids, and minivans that sell for amounts in the neighborhood of the Accent’s starting price of around $15,000. Many of them offer more space, better fuel economy, or all-wheel drive—but none of them have Hyundai’s 10-year, 100,000-mile powertrain warranty. And when it comes to new cars, nothing beats the Honda Fit. It offers more optional features than the Accent, gets better gas mileage, and has a massive interior that belies its small footprint. But if you’re in the market for a small, affordable sedan and want a new-car warranty, the 2018 Hyundai Accent should be on your shopping list. 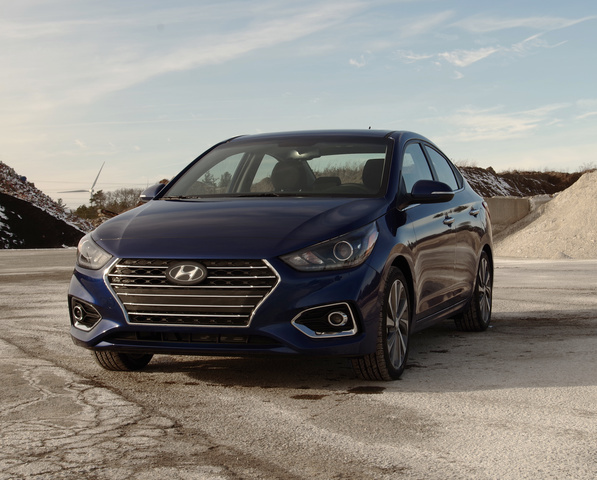 What's your take on the 2018 Hyundai Accent? Have you driven a 2018 Hyundai Accent? Enter your zip to see incentives for a new Accent in your area. Looking for a Used Accent in your area? CarGurus has 13,321 nationwide Accent listings starting at $1,799. What will happen to my Hyundai Accent if i dive it until all the gas has run out?